Today's taffy apples, whether home-made or commercially produced, often have so many sticky layers, the fruit - after which they are named, is almost an afterthought. The taffy apples I remember from my childhood used to be, just that - apples with caramel on the outside and maybe a light chopped-peanut layer, but that was all. In those less extravagant times no one bought taffy apples. We made them at home. I remember standing in the kitchen unwrapping square after square of caramel so that the process of melting them could begin. The washed apples sat next to buttered waxed paper squares which would be used to wrap around the dipped apples after the caramel had cooled off. Each apple was also partnered with saved popsicle sticks, (we didn't buy those, either). We melted the caramel squares into a gooey, golden sauce. Sticks were punched into apples and the dipping process began. Each piece of fruit was rolled into the melted candy, lifted out and twirled until the caramel cooled and stayed in place. This fall ritual was much anticipated, but I could never understand why, after all that work, my mother warned us that eating caramel apples would pull out our fillings! No matter how difficult it was to actually eat this sticky treat on a stick, I never lost a filling! Today's recipe is not a caramel apple, but the flavors are similar to one. 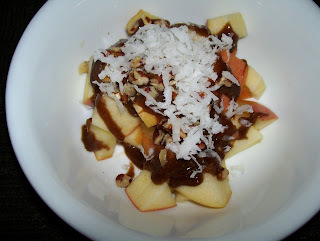 The apple is cut up, drizzled with a satisfying coating and sprinkled with nuts and coconut. Maple-Nut Apples is simple to make and is guaranteed to be gentle on your fillings! Cut apple into small pieces and divide into two helpings. Mix butter, syrup and extract evenly and well. Drizzle butter mixture over each plate of apple pieces. Sprinkle with nuts and coconut. Serves 2.